Hello out there, lovely readers. I’m Ally Blue. 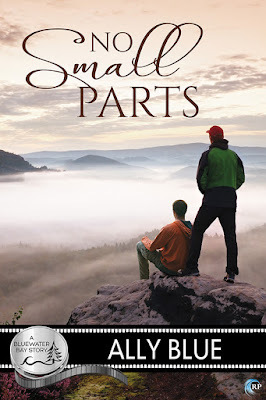 Welcome to the blog tour for my new book, No Small Parts. It’s the latest addition to Riptide Publishing’s awesome Bluewater Bay universe. I love this story, I love my boys—Nat Horn and Rafael Cortez—and I’m excited to give y’all a glimpse behind the scenes. Thanks so much to my blog hosts for having me here, and thank you all for joining me! Nat Horn is almost living the dream. His part as a werewolf extra on the hit show Wolf’s Landing has somehow turned into a regular role. Beautiful rising star Solari Praveen has taken an interest in him. He’s even making enough money to think about getting out of Bluewater Bay someday. Except his retired dad’s dependence on pain medications seems to be getting worse, and Nat’s the only one around to take care of him. When Nat learns that Solari’s interest isn’t romantic, his disappointment is surprisingly short-lived, because in getting to know her, he also got to know her assistant, Rafael. And Rafael turns out to be the kind of friend—and potential boyfriend—Nat never dared to dream about. Distracted by his astonishing new life, new friends, and new possibilities, Nat lets his guard down, and suddenly his life goes careening out of control. Racked by guilt, he tries to push his new friends away, but the bonds he’s formed are already too strong. In fact, they’re strong enough to pull him forward, into the future he’s been longing for—but to get there, he’ll have to let go of the past. Ally Blue is acknowledged by the world at large (or at least by her heroes, who tend to suffer a lot) as the Popess of Gay Angst. She has a great big suggestively-shaped hat and rides in a bullet-proof Plexiglas bubble in Christmas parades. Her harem of manwhores does double duty as bodyguards and inspirational entertainment. Her favorite band is Radiohead, her favorite color is lime green and her favorite way to waste a perfectly good Saturday is to watch all three extended version LOTR movies in a row. Her ultimate dream is to one day ditch the evil day job and support the family on manlove alone. She is not a hippie or a brain surgeon, no matter what her kids’ friends say. To celebrate the release of No Small Parts, one lucky winner will receive an ebook from Ally’s backlist! Leave a comment with your contact info to enter the contest. Entries close at midnight, Eastern time, on December 24, 2016. Contest is NOT restricted to U.S. entries. Thanks for following the tour, and don’t forget to leave your contact info! Congrats on the new release Ally. Great blurb. Love the Bluewater Bay series. Congrats on the release, I'm excited for another Bluewater book!